I came away from the Auckland Foodshow with a bottle of Te Mata Fig syrup in my bag. I love figs but I'm not crazy about all those little pips which tend to stick in your teeth so I was delighted to find that in this product they had been removed leaving only the fruity fig syrup. 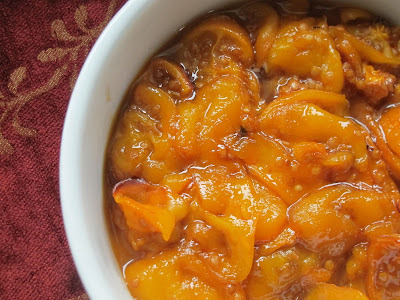 I roasted some golden tamarillos in it, and let it reduce into a deliciously sticky sauce. Only a few drops of vanilla were added. More and the delicate figgy caramel flavour would have been overwhelmed. We used to grow tamarillos when we lived in Hamilton. Unfortunately the tree grew crooked so that the entire crop would fall into the neighbour's garden.Oh well, at least they enjoyed them. Pour boiling water over the tamarillo skins and leave to stand for a minute or two. Slice the tamarillos and put them in an ovenproof dish in a single layer. Mix the fig syrup with the brown sugar and pour over the tamarillos. Roast in a medium oven (180 degrees C) for 30 minutes or until the sauce has reduced and is sticky. This fig syrup can also be used straight out of the bottle over yoghurt or ice-cream or in cocktails.